After the madness of the 2015 harvest the month of December in the winery is relatively relaxed. All the wines (except Albariño) are in barrel, and for the most part they'll happily stay there until the new year. This month I'll spend a lot of time in our onsite laboratory, analysing the wines regularly to make sure they're on track. All our red wines, as well as our Chardonnay are going through malolactic fermentation, when specific bacteria convert the tart malic acid to softer tasting Lactic acid. The vast majority of red wines around the world will undergo this process, as well as a good proportion of full bodied whites. The bacteria that make this conversion are happiest at 20˚C, however so are the bacteria that turn wine into vinegar, so it's a risky few months. Of course the lab analyses can give us numbers and tell us what's going on inside the wine, but it can't tell us the most important thing - how does it taste..? For that we have to get stuck in ourselves and have a glass. Or two..
Another big part of the holiday season for us is showing off the winery through our tours, tastings and events. We try and do things differently at London Cru, so visitors are taken directly into the production area of the winery, rather than being received in a typical cellar door. We’re a small, boutique, but very much working winery and we like to show people the equipment and explain the processes while they taste. Our equipment is simple, low tech and labour intensive, however we feel it’s the best available to bring out the true characters of each wine. During tours we can teach as much or as little as you might want to know about wine, but we steer clear of wine snobbery; our philosophy is if a glass is half full then there’s room for more.. Apologies for the radio silence, as you can imagine, things have been a little bit hectic here at London Cru in recent weeks. The following will give an insight into what you’ve missed. Chardonnay grapes from our man, Maurice, in Limoux, arrived at the beginning of the month. Good picking conditions greeted us in the foothills of the Pyrenees and the grapes themselves were at a perfect level of sugar ripeness and acidity. When the grapes arrived in London they were whole bunch pressed with minimal sorting (having received a primary triage in the vineyard before transit). Clear juice from this year’s Chardonnay, a new site and region for us, meant that once again we had no need or desire to add enzymes for clarification. Instead, we allowed the juice to settle in tank for around 24 hours before transferring to barrel to begin fermentation and élevage. Gavin has made Chardonnay in both his native Margaret River and under his own label in Burgundy, so knows more than a thing or two about how to bring out the best of this grape. Our first two Chardonnays have shown unmistakable varietal character, textural complexity and fresh acidity. With a fantastic new vineyard to work with, we aim to deliver another wine in a similar vain. To achieve this we must carefully select the yeast strains we use as they have a significant impact on the resulting wine. We have used three cultivated yeasts, isolated in Burgundy, and have left three barrels to naturally ferment. By using different varieties, we are able to augment and promote particular characteristics. For example, one of our yeasts has the ability, due to its enzymatic profile, to promote the appearance of varietal aroma precursors, producing a wine with an elegant nose. Another aids textural complexity by producing more polysaccharides. These build suppleness and volume, promoting a ‘rounded’ mouthfeel. The natural yeasts bring added complexity to the party. At the time of writing, all but a handful of our Chardonnay barrels have completed their primary fermentation. A particularly warm and dry summer in North-west Italy meant that our pick date for this year’s Barbera was atypical. The grapes for both the 2013 and 2014 wines were harvested well into October, whereas this year we’d barely gotten beyond the half way stage of September before the call came through from the Codero family to say the fruit was ready. Early indications suggest that the 2015 Barbera is going to be special. All 7.8 tonnes of fruit, our biggest single pick to date, was pristine on arrival, allowing us to sort through in record time. Appearance aside, the grapes have incredible acidity and sugar, as well as delicious flavour. Once sorted and destemmed the grapes were loaded into two steel tanks and one of our new concrete fermenters. After a few hours skin contact we drew around 700 litres of juice from the bottom of the tank, a method of rosé production known as Saignée. This was then sent off to a separate tank where it will ferment and age, eventually giving us a delicate rosé in a Provençal style. The grapes had a few days to cold soak before fermentation, a useful process for the extraction of aromatic precursors, after which all three tanks were then inoculated to allow the ferment to begin. Fermentation management is split between a regime of pump-overs and punch downs. The colour of the young Barbera wine is a stunning, intense purple; needless to say, we’re all now proud owners of perpetually stained hands. At the time of writing, the ferment temperatures have risen to around 30°C and we’re now under a week from their completion at which stage we will press and send off to the wine to steel, concrete and oak for ageing. Last Tuesday Gavin and I headed down to Puimisson, Langudeoc to pick our third grape variety of the harvest; Cabernet Sauvignon. In contrast to the unusually early pick date for the Barbera, we found ourselves picking the Cab two weeks late (according to the 2013 and 2014 harvest). Things have a strange way of working out though, as what appeared like a setback early on has worked out ideally in terms of the ripeness of the grapes and how they fit into our schedule. I’ll admit, I only lasted around 3 hours in the vineyard, all the time being put to shame by the speed and efficiency of the team of Moroccan pickers who made light work of a big task. After this, I moved on to helping Jeff and Michel load the tractor, before helping Gavin to load the truck. One of the merits of organic management is that wildlife is able to flourish, including some audacious individuals trying to hitch a ride back to the UK (see below). On top of spiders, mites and the occasional mantis, the most successful passengers were hordes of organic escargot. If we’d had a larger team we might have collected them and seen if any of our neighbouring French bistros could've taken them off our hands. Back in London and back in the winery a few days later, with a team half the size of the previous weekend, we set about processing the Cabernet Sauvignon grapes. Given the ripeness of this year’s fruit, there was no need to use the crusher to liberate juice from the berries. A consequence of tightly-bound bunches is that our destemmer wasn’t operating as efficiently as it did for the less compacted Barbera bunches. The answer; load whole bunches straight into the destemmer and then onto the sorting table afterwards - effectively hand sorting berry by berry. This method allowed stem fragments, any poor quality berries, snails etc to be removed. Exactly the same programme of fermentation vessels was used for the Cabernet (2 steel, 1 concrete) but without a cold soak. Punch downs and pump-overs are both being carried out and at the time of writing, the ferment temperatures are slowly rising and the rate of CO2 production is increasing. Later this week, Albariño will be arriving from Galicia ahead of the arrival of our next red, Grenache from Calatayud, next week. Spring always seems to breathe positivity after the long winter months. The weather gets warmer, the day’s get longer and the barbecue edges closer to making its first appearance of the year. Meanwhile, here at London Cru, all of last year’s hard work from vineyard to winery begins to fall into place. All six of our 2014 wines (Chardonnay, Bacchus, Syrah, Grenache, Cabernet Sauvignon & Barbera) are developing nicely, with some key milestones passed in the last fortnight. All, bar a couple, of our Cabernet barrels have now fully completed Malolactic fermentation. For those that haven’t attended one of our ‘Meet the Cru’ tours, or are otherwise not in the know, this is the process through which the acidic composition of the wine changes. Malolactic fermentation (MLF) sees the tart malic acid (think of that first bite into a Granny Smith apple) convert into the softer, more rounded lactic acid (think milk and yoghurt) through the action of the bacterium, oenococcus oeni. This is a process that all of our red wines go through, as the combination of malic acid and tannins would otherwise leave the wine astringent and not particularly palatable. If this process isn’t completed during winemaking then it could start spontaneously in bottle, causing a haze, some fizziness and off aromas. White wine; by contrast, doesn’t always have to undergo this transformation. For the 2013 Chardonnay, Gavin chose to complete full Malo’, leading to its subtly textured character. However, for the 2014 Chardonnay he’s chosen to go half Malo’ in order to deliver a fresher style. 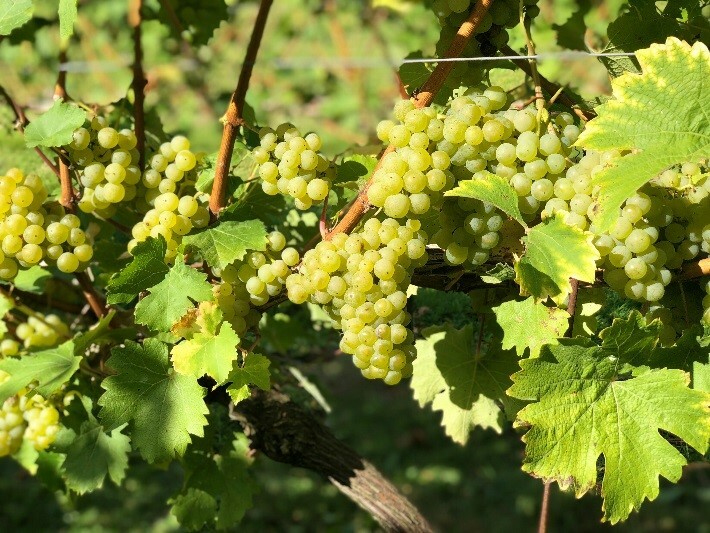 Aromatic white varietals, such as our Bacchus, seldom complete MLF. After each barrel completed malolactic fermentation we added a small amount of Sulphur Dioxide. This preserves and protects the wine against three threats: Oxygen, bacteria and spoilage yeasts like Brettanomyces. Minimising oxidation allows the wine’s fruit character to be conserved. The anti-fungal/antibacterial properties of SO2 have another benefit in slowing Brettanomyces or Acetobacter from flourishing, thus preventing the build-up of undesirable aromas or acetic acid (Vinegar): a volatile acid. 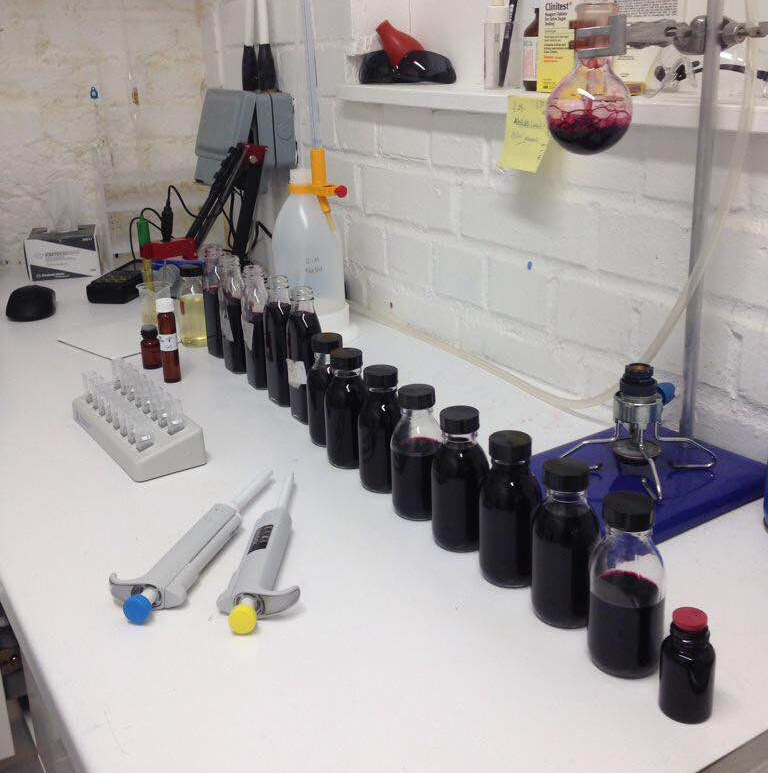 Another test carried out in the past few weeks was to check the Volatile acidity (VA) of each of the wines. The results from the spectrometer thankfully made for satisfying reading. The most significant steps made recently were with the Bacchus, our first wine from English grapes. We have established the final blend; heat stabilised and racked the wine off its lees. Over the weeks leading up to bottling in early April, cold stabilisation will take place and allow the removal of any residual tartrate crystals. Having ‘benchmarked’ our Bacchus against other British producers we are happy that our blend will hold its own alongside its peers. Expect our Bacchus to exhibit delicate varietal and quintessentially English characteristics with a touch of textural complexity as a result of partial oak aging. Hopefully by the middle of May, London Cru’s first Bacchus will be ready for drinking, just in time for summer! We can hardly contain our excitement with how our 2014 wines are shaping up. After tasting samples from the barrel last week, we believe that a step forward has been taken since our impressive inaugural vintage and that we have some truly special wines on the way for you. Don’t take our word for it, come and try for yourself at the winery. One of our main goals here at London Cru is to make wine approachable to everybody. You can, of course, come down and take one of our Saturday afternoon tours. On the tour, we give you a behind the scenes look at what we do around here as well as some of the cracking wines we made this year. However, if you’ve ever harboured dreams of getting into the nitty-gritty of what it’s like to be a part of the actual winemaking process, you might want to look into our Winemaker for a Day sessions. We recently had our first WMFAD session and it was not only sold out but a lot of fun! Guests were first given a rundown of the fundamentals of wine tastings, the components of wine, a tiny bit of wine science and the art of wine blending before being let loose to create their very own wine blend. Two members of London Cru were on hand to help out with any questions or to give advice on how to achieve just the right blend. Once the blends were done, guests were led on a tutored tasting of London Cru’s wine (which were still in barrel at the time) before being presented with their very own blended wine to take home. You can really work up an appetite doing all that blending so we include a two course lunch break with wine at The Atlas pub halfway through the day to keep you going. Last Monday, our last load of grapes, Barbera from Piemonte, arrived at the winery and we got to work. The Barbera was a last minute replacement for the unfortunate loss of Sauvingon Blanc and Merlot we were supposed to be getting from Bordeaux. Despite that, the Italian grapes were more than up to the task, coming in looking beautiful and sailing through the sorting table in the winery. After triage, the grapes were quickly put into the stainless steel tanks and within a day or so we had added our yeast and let them start fermenting. The Barbera is still fermenting as we, er, type, but we expect it to be done soon and going into barrel. Gavin has also filled 2 integral barrels with the Barbera grapes to see how they ferment in the oak. 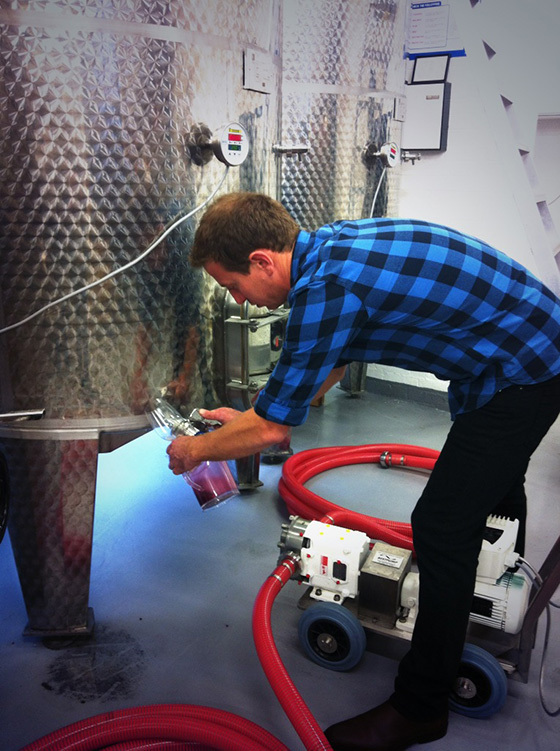 We had some juice left from the 4.6 tonnes of grapes so Gavin decided to make a rosé! Exciting stuff! The rosé is already in tank and we’re hoping it will be ready in time for our launch party. As there was so little of it we’ll probably save it for in-house events, so if you get a space on one of our first public tours in November you might be lucky enough to try it! We’re really busy right now getting ready for our grand opening in a few weeks. We’ll be giving tours of the winery everySaturday, starting on Nov 9th. Tours will cost £15 including a tasting of some of our wines, and afterwards you can have a drink and something to eat from our pop up bar. If you want a bit more in-depth experience in the winery, we’ll also be offering “Winemaker for a Day” sessions, where you will learn what’s in a winery, how wine is made, and even blend your own bottle to take home. We'll also be holding regular Supper Clubs on the second Monday of each month, starting with Nathan Green, head chef at Michelin star restaurant “Restaurant Story”, on the 11th of November. Be warned, we think that one’s going to sell out very quickly, but if you don’t get tickets, December will bring another exciting chef to London Cru. Be sure to join our mailing list if you haven’t already. This way you’ll be the first to hear about events at London Cru and when tickets go on sale. We’ll also be offering some free tours once we open to the people on our mailing list, but you didn’t hear that from me! Last Sunday a few of the London Cru team travelled to Puimisson in the Languedoc-Roussillon to visit Jeff Coutelou. We were there for the harvest of the beautiful Cabernet Sauvignon grapes he had agreed to sell us for our first vintage. If you know Roberson Wine you will have heard of Jeff and Mas Coutelou. To say we are fans would be an almighty understatement. He is without a doubt one of the purest, most genuine and gifted winemakers we have ever worked with. We were jumping for joy when he said he was interested in our project and would sell us some of his amazingly well-cared for fruit. The reason we were lucky enough to get our hands on it is because a few years ago Jeff made the decision to only work with indigenous varieties like Carignan, Mourvèdre, Syrah and Grenache. His grandfather had planted the Cabernet vines and he can’t bring himself to pull them up, so he’s been selling the grapes to a local co-op, but he treats them exactly the same as his other ‘children’, with an incredible amount of love and attention. The fruit was pristine, incredible for an organic, biodynamic grower who uses purely natural methods in the vineyard, and after a long day picking with Jeff’s team (who all seem to idolise him) the refrigerated truck was packed up ready to set off for London. We’re please to say it arrived this morning in perfect condition and is being processed downstairs in the winery as I write this. Now we just need Gavin to make wines as good as Jeff’s. No pressure Gav! 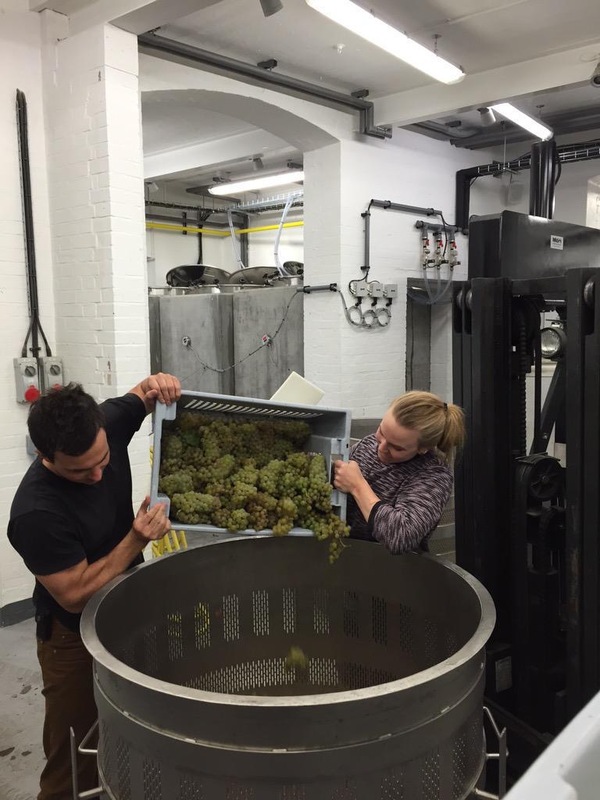 Hello and welcome to our brand new blog for London Cru – London’s first small scale winery.